Recommended Name: the Tell pattern Type 1. Alternative names: Helvet Német Kettös Kártya, Feine Schweizer Deutsche. Around 1835 a new pattern emerged in Pest in Hungary, with Obers and Unters showing characters from Schiller`s Swiss history play "Wilhelm Tell". The mounted Kings were the traditional symbol of sovereignty in Hungary. The allegories of the seasons on the Deuce cards appear to have been based on a single figure pack designed by Matthäus Loder in Vienna in 1823 or 1824 and printed there by Uffenheimer in 1824. The first makers of the Hungarian double-figure pattern were probably Joseph Schneider and Ödön (Edmund) Chwalowsky, both of Pest. By about 1850, this pattern was being produced by other cardmakers in Hungary, e.g. K. Walbacher also in Pest and Antal Salamon of Kecskemét. In about 1860 it gave way to a version with rather different representations of the Seasons, and slightly different representation of the Obers and Unters [IPCS #92]. From about 1890 the Tell pattern generally replaced all the other German-suited cards used in Hungary (the Hungarian and Oedenburger pattern). 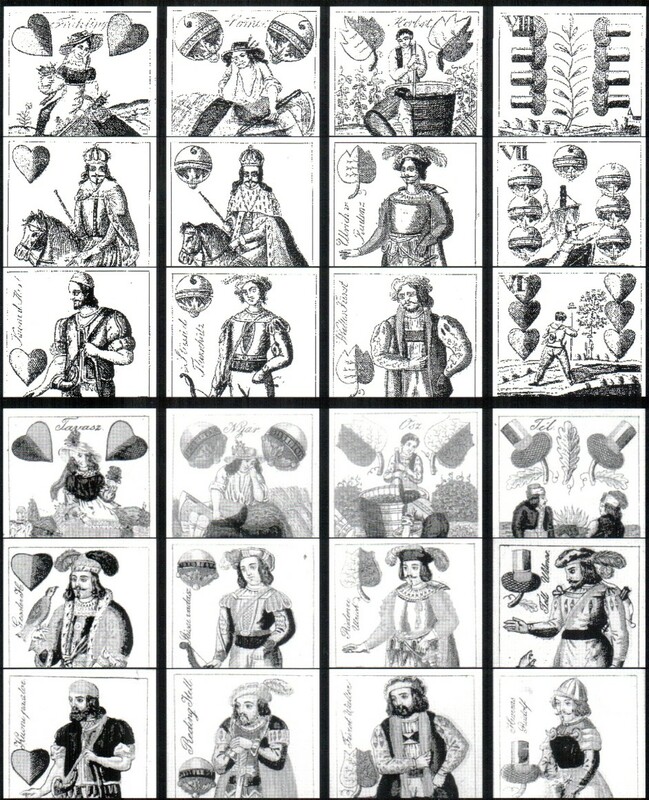 Although the Obers and Unters represent heroes of Swiss history, cards of the Tell patterns have never been produced or used for games in Switzerland. Acorns "Tél" Winter (two men in fur hats by a camp fire). The Kings are royal figures on horseback. Hearts "Hermann Gessler" / "Geszler Hermann"
Leaves "Ulrich v. Rudenz" / "Rudenz Ulrich"
Acorns "Wilhelm Tell" / "Tell Vilmos"
Bells "Itell Reding" / "Reding Itell"
Leaves "Walter Fürst" / "Fürst Walter"
Acorns "Rudolf Harras" / "Harras Rudolf"
(In Hungarian the last name is placed first). On the pip cards are depicted some typical places, events and people from Schiller’s play. The name of the maker usually appears in a central panel on the VII of Acorns. Josef Schneider, Pest, c.1835; Edmund Chwalowsky, Pest, c.1845; Karl Walbacher, Pest, 1855; Josef Wilner, Pest, 1858; Stefan Zsiros, Pest, c.1850; Gottfried Fischer, Tyrnau, c.1840-45; Antal Salamon, Kecskemét, c.1855 (reproduced in facsimile by Piatnik in 1992). REISINGER, Klaus, Herz, Schelle, Laub, Eichel, Wien, 2004. MANN, Sylvia, Alle Karten auf den Tisch – All Cards on the Table, Leinfelden und Marburg, 1990. JÁNOSKA, Antal, A Magyar Kártya – Die ungarische Karte, Budapest, 1997. JÁNOSKA, Antal, Játékkártyák Magyarországon, Kecskemét-Wien, 1991. ZSOLDOS, Benö, A Játékkártya és története, Budapest, 1980.
bottom three rows: Karl Walbacher, Pest, c.1860 (Legfinomabb Helvét Német Kettös Kártya).